Before we moved to the UK last year I was fortunate to connect with Carine from Montessori Family. She was a Montessori teacher and now runs a parent-toddler group in Central Bedfordshire. Carine has become a good friend and I relate to her style of parenting. I also appreciate the many hours she spends helping and educating Montessori parents from around the world. She is tireless and she is passionate. So when Carine brought out a Montessori Family subscription box I already knew it would be something I would like and knew I could trust the contents. The Montessori Family Box is for children aged 3-6yrs. Otis is now seven but I thought he would like the Montessori Family Box theme of birds so we decided to give it a try! I also found that many aspects of the box would also be useful for younger children, we've involved Otto in some of the activities too. Our Montessori Family Box as pictured is c/o Montessori Family. What I like about the Montessori Family Box is that the materials are adaptable to your child's age, skills and, abilities. Although instructions are provided, you can use the materials as you like. Below we have taken one of the three-part cards on a bird hunt. I know it's likely we will find a blackbird, so I have introduced the (verbal) word 'blackbird' to Otto and we go out looking for blackbirds - and find one!! Later we could use the cards for matching or sorting and next year or even the year after Otto can use them as three-part cards. The materials are of high quality, they are all professionally made. The images are clear, the paper is glossy and the cards are thick. Each month the theme changes, so you can introduce them to your child or save them for when an interest arises. The Montessori Family Box is available for shipping in the UK and across Europe. 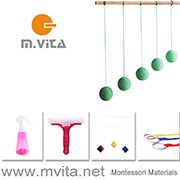 Written instructions and an introduction to the Montessori Method. Access to a members area on the Montessori Family Website including videos on how to present and use the materials and extra resources like recorded bird sounds. Bird Three-Part Cards - including birds from different habitats, with label cards, which also allow for sorting per habitat. Parts of a Bird Three-Part Cards - these allow the child to learn and identify parts of the bird. Bird Collage Materials - a picture of a bird with feathers for pasting including fine motor work. Beautiful Spot the Bird sheets - these encourage you to go outside and sport the bird, in three different habitats. Once we've used these on our nature/forest walks we will be cutting out the pictures are using them in collage or perhaps also for language materials. The pictures are too beautiful not to reuse them. If you've ever made your own three-part card you will know how much work goes into them. If you haven't used three-part cards before this is a great place to learn and try them out. There are hours, perhaps weeks worth of potential lessons or work within these materials. Once the Montessori Box is sold out the same theme won't be available again for two years. So if there is a chance your child will like the theme it's best to order a box and put it aside or it might spark an interest now. Some of the Montessori Family Box themes include: colour exploration, moon cycle, seasons, continents, birds, and, land/air/water. I wish we had ordered the colour exploration box when it was available as I love this theme but will keep my eyes out for next time it comes around!! 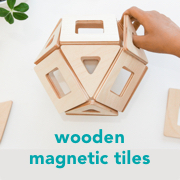 All of the details of the Montessori Family Box can be found here. Thank you Carine for our Montessori Family February Box. The theme for the Montessori Family March Box is Seasons! Above, I've found a few wooden trays like this in charity shops. This one was £2, it has a center bowl surrounded by five leaf shapes bowls. It's suitable for snacks, or sorting activities or for a playdough tray. Above, we found a large bag of buttons for £1. Buttons are wonderful for loose parts (more of a Reggio type activity) but I knew they would fit perfectly into our red bus money tin. Otto (17 months) loves this as he can independently post all the buttons into the money box tin and then open the tin to retrieve the buttons. Look at that little pincer, this is an excellent fine motor activity! With small parts this activity requires supervision. While you could call this an open-close tray, as all the containers are tins, it's more like lid matching. I specifically made this tray using all tins. Some of these tins are from the dollar store, I look for tins for tea, chocolate, spices and, candles. Even in the supermarket I look for products in cute tins or jars that I can reuse somehow. WIthout even matching the lids, Otto finds it satisfying just opening and closing one tin! It is almost like doing a puzzle "yes, that fits!!". This mirror tray is from the Dollar Store (Poundland) for £1. I've been looking for mirror trays but they are super expensive. This is smaller than I wanted but it works. Look at the pretty reflections. The mirror has a hook on the back and is designed to hang on the wall. But we are currently using it in our nature table to display items from the seashore. I also want to use it as a loose parts (again more Reggio) exploration tray for Otto. It would also work well with transparent blocks. Our charity shops always have a lot of baskets, but I've been looking out for larger baskets. This one above works well for a music basket and now we are using it for a nature basket, it holds so much. Otto loves big baskets like this as he can really get his hands in and sometimes he will sit in the basket. I'm now thinking it would also be a nice basket to put our journals and art materials in when we do some nature journalling. This one was £2 and when we are finished with it we can donate it back! I encourage you to look around your home and donate where you can, I know it means a lot to many Montessori families to find suitable materials for their children in charity shops at reasonable prices. Some parents are choosing this Montessori school because of its diversity - How a diverse Indianapolis Montessori school quadrupled its applications in two years at Chalkbeat. Also, who knew there were some 500 publically funded Montessori schools across the United States? We know that a consistent home and school environment is important but to what extent do parents of children who attend a Montessori school actually Montessori at home? at The Journal of Montessori Research: "In the present study, greater (self-reported) patience was associated with providing children with choices, encouraging autonomy, and other behaviors that reflected doing Montessori at home. It is possible that parents who had more peaceful or positive childhoods were better able to remain emotionally calm to encourage children’s independence." If you are a teacher I suggest reading the end discussion on the importance of supporting (and educating) parents at home. Are you still making your children's lunchboxes? This is a good read Lunches (Part 2)... The Bridge to Independence at Villa di Maria Montessori School. It's the start of our first European Autumn and Otis has been enjoying collecting Conkers. Muddy Faces has a good list of Conker Inspiration for children. Over the last few weeks, Otis has been attempting to grow crystals. He has used a couple of science kits and only had success with this one by 4M, it's one that we would recommend! If you are looking for some Montessori toddler kitchen inspiration, this space is lovely at The Natural Montessorian. This makes me miss home and our previous Montessori toddler classes. Tour of a Montessori toddler classroom in Amsterdam at The Montessori Notebook (this is an updated version). Autumn Nature Tables to Love! Today we swapped over some of our Summer books to make way for our Autumn books. The days are becoming shorter, darker and cooler. We are slowly adding Autumn items and materials to our nature table. I call it a nature table although it is also, very much a seasonal table. I love the warm colours and the glow of Autumn nature tables. Below I'm sharing some nature tables that have given me ideas and inspiration. Many of these are in Australia - if you are thinking the dates don't add up. Most of these are Waldorf inspired. To make them more suitable for a Montessori home I would remove references to fantasy, even for my older children I make our nature/seasonal table reality based. I would also ensure there are lots of items from nature, perhaps that the children collect or bring home throughout the season. Above is just a small snippet of what is becoming our Autumn nature table! I love the textures here, the use of silks and felt. We've used a window (and window picture) for light but above is a little lamp, l love the idea of bringing a little bit of a glow/light to the nature table. Beeswax candles would work well too. Yes, bring in all the leaves and pine cones! The children's painting and the hanging leaves are everything! Not a nature table but I'll be making these with my children - an Autumn mobile! Can we start sharing more Montessori based nature and seasonal tables? Tag me @howwemontessori or #montessorinaturetable. This post contains images embedded from Instagram, if you are viewing this via email or blog reader please click here to see the full post. Nature Journaling with Children - Keep it easy, fun and simple. Have you tried nature journalling with children? It can be frustrating when our expectations aren't in check. I'm here to say let go, keep it simple and allow your children the freedom to use their nature journal as they like. Why? What are the benefits to the child? Allows the child to slow down, breathe, relax, refocus, it can calm a busy mind. Encourages observation - observing the big picture to the small detail. Use senses such as sight, sound, smell and touch. Helps to create a connection to the natural environment. "Many people find that in learning about the natural world, they learn more about themselves." - Clare Walker Leslie, The Curious Nature Guide. Ideas for children who don't love drawing? Add photographs (print at home or we love the Instax which prints immediately). Add interesting found things such as (non-toxic) leaves, feathers, wildflowers, perhaps small pieces of bark or take home flowers to dry and press. Write labels or descriptions of found things and look up the scientific names. Use single words to describe the environment such as "bright", "green", "warm" etc. Use colour only to capture the environment, perhaps shade or paint in different greens (trees), blues (sky or ocean), different browns (tree trunks). This allows the child to express themselves through colour rather than through specific images or pictures. Use collage, perhaps use some of the dirt or mud, leaves of wildflowers or other found things. Use rubbings of the tree trunks or leaves, you may need extra sheet paper and crayons or charcoal. Journals - at the moment we are using an A3 Recycled Hardboard journal, it has thick pages (good for using watercolours) and the hardboard cover is perfect for using outside or on uneven surfaces, currently we like the size and the children are able to decorate or personalise the cover which is great for sense of ownership.Crayon Rocks - good for shading large areas. Crayon Rocks - good for shading large areas. Child's Nature Bag - to hold camera and collected items. Markers - I would prefer my children use pencils but at the moment they love using markers. Date the page and note the location. Add time and weather conditions. Use the child's nature journal for extension and exploration ideas such as learning about specific ecosystems or species. Note down any questions the child asks while journalling. Make note of anything rare, under threat or of things you see for the first time or the first time in the season. In the past, I've felt intimidated by nature journaling and disappointed when my journal wasn't as beautiful as these. However, I remember my purpose and know that keeping a simple nature journal works best for me and my children. "Just keep in mind that these notebooks are designed to help cultivate within your child the joy of nature and discovery, not to become a source of irritation, frustration, or competition." - From Simply Charlotte Mason, The Secret of the Nature Notebook. I want to inspire my children and ignite their adventurous spirits. The more time we spend in nature, the more time we spend investigating, searching, exploring and ultimately record keeping, the more I see my children being open-minded, kind spirited, respectful and connected to themselves, to each other and to their natural environment. It's Spring - On Our Nature Table! Otis and I have been working on our spring nature table. It's fluid and it changes daily! The process has been child led, I've made plenty of suggestions but Otis has put the table together. Spring is fantastic for learning about life cycles of plants and animals. Spring is full of colour and life and I think our nature table reflects that. The nature table provides the perfect opportunity to bring learning from outside to inside! We are doing lots of learning about birds, feathers, nests, butterflies, bees and flowers. I've labelled lots of the items for Otis. His reading is really developing and I want to provide a language rich environment. We also have a spring themed book basket next to the nature table. This nature table is definitely for touching and playing. Otis loves this little play scene above.